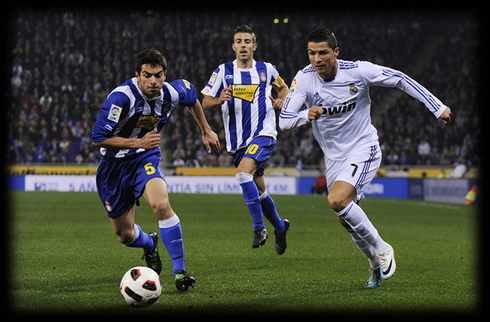 13.02.2011 » Espanyol 0-1 Real Madrid. Ronaldo assists Marcelo for the lonely goal. Real Madrid played almost 90 minutes with 10 men and pulled of a great victory against Espanyol. Cristiano Ronaldo didn't score, but assisted Marcelo for the winning goal. Real Madrid taught a very important lesson to all those who said La Liga isn't a priority for this team anymore. Iker Casilla's red card on the 2-minute mark forced "the Whites" to showcase many of their values (hard work, epic nature, sacrifice, winning personality) to earn a very important victory over Espanyol tonight that reduces their distance with the leaders to 5 points. Cristiano Ronaldo didn't score but created many chances for Adebayor to finish. Iker Casillas was sent of for marginally kicking Espanyol forward, Callejon, on his right foot as he tried to clear the ball right outside the box. Other teams would have deflated following such a decision, but Real Madrid pulled rank and doubled their efforts to win. Di Maria had to come off for goalkeeper Antonio Adan, who made his First Division debut tonight. Khedira soon had two chances to score the opener. Marcelo would net the only strike in the evening from a fantastic shot near the left post, after being assisted by Cristiano Ronaldo (24'). Adebayor then had a chance to seal the match on the 39-minute mark, but his lobbed shot hit the crossbar. Real Madrid concentrated hard in the second half and sycronised their movements in defence and attack, making extraordinary efforts to thwart Espanyol's counterattacks. José Mourinho gave a true tactic lesson. Real Madrid continued to have most of the chances on goal in the game. Adebayor came close to netting a second strike twice more, but Kameni defeated him on both counts. Espanyol didn't have many chances, but Adan proved to be a solid keeper, clearing all the shots that were on target, from both Adebayor and Cristiano Ronaldo. Real Madrid made a great impression and took three very important points that keep them five points behind the leaders. They will now concentrate on defeating Levante next week at the Bernabeu, knowing that Casillas won't play. Cristiano Ronaldo keeps leading the goal scoring table, even though he didn't score this weekend.